Anyone know where on the Net a full listing can be found? or want to contribute to making one? “We’ve got to place big bets”, Bill Ford, Jr.
OK, Then Launch An Electric (Not Hybrid) Mustang! Last edited by 2b2; 08-16-2017 at 10:39 PM. 9.0-9.2kWh BMW X5 xDrive40e Plug-in 111ehp + 2.0T 240hp = 308hp tot. 8.9 kWh 2017 Hyundai Ioniq Plug-in 45kW/61PS + 1.6GDI 78kW/105hp = ? 8.8 kWh VW GTE Plug-in Golf 101-102eHP + 1.4 gas 148-150HP = ? 7.1 kWh BMW i8 Plug-in 96kW/131ehp + 1.5T 3cyl 172½kW/231hp = ? Last edited by 2b2; 07-16-2017 at 10:26 PM. For China, a PHEV has to offer 31 EV miles to qualify for the consumer to qualify for the subsidy. This is why the Mondeo PHEV coming to China late this year will have a larger battery pack than the Energi models sold in the US, and offer 31 EV miles. A 10-mile increase. The question is why has Ford not offered this larger battery pack in the current Energi models in the US? Do they really need to be forced to compete? Which shows a lack of dedication as it relates to electrified vehicles? This should have happened with the Fusion and C-Max Energi update. Could it just be cost? Maybe they can't increase capacity without increasing the sticker price? Can someone contribute a countUP of H/PHEV/BEV available models as they've increased over ~the past 2 years? ...or even better, since the Fusion-Energi came out?? Ah, the eternal debate, does size really matter? wiki, "...A plug-in hybrid version, the Ford Fusion Energi, was released in the U.S. in February 2013..."
Last edited by 2b2; 07-30-2017 at 05:04 PM. 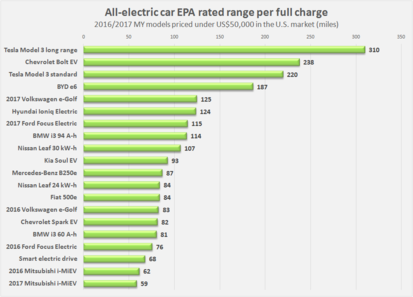 Let’s be clear, despite various comments and announcements from executives at the “Big 3” auto companies (Ford, GM, and Fiat Chrysler), they obviously have yet to really embrace electric cars. That’s it, a grand total of 3 currently available pure-electric vehicles (BEVs) and 5 plug-in hybrids across 3 car companies that sell 8 brands of cars and trucks. Two models (Cadillac ELR and Chevrolet Spark) were discontinued in 2016 and one, the Fiat 500e, is a compliance car and only available in two states. Are the Big 3 About to Get Serious About Electric Vehicles? General Motors: Nice Job With the Bolt, But Hey, What Do You Do for an Encore? Last edited by 2b2; 07-30-2017 at 06:06 PM. It may be that with the density of battery cells in flux, it's more about how much 'range' that's most important to consumers as opposed to just the battery or pack size. So you're saying it's about raw power and not just physical size? Does speed play into this too?